Russell promises to ride the Pugsley next year so this doesn't happen again. What does it say that more than 650 people read the post about the ride from Milwaukee to Belgium and back, but only 5 people decided to do the ride? 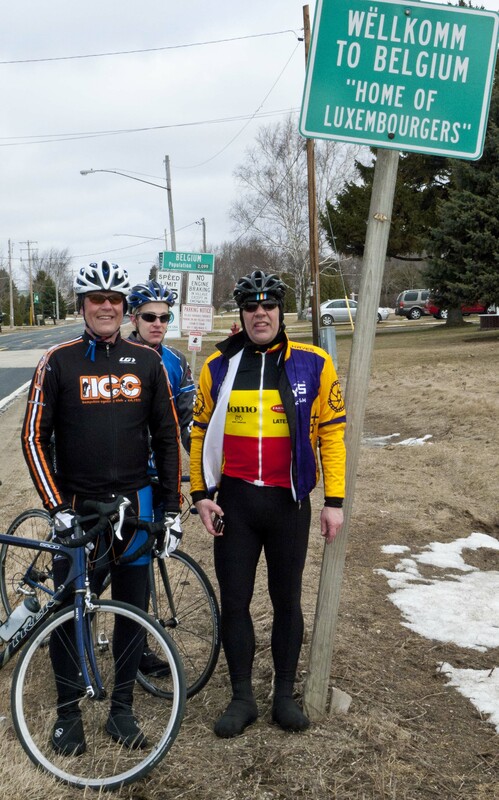 Jim, Ben, Russell, Gary and yours truly were the only takers for the inaugural start to the Over the Bars Spring Classic series. 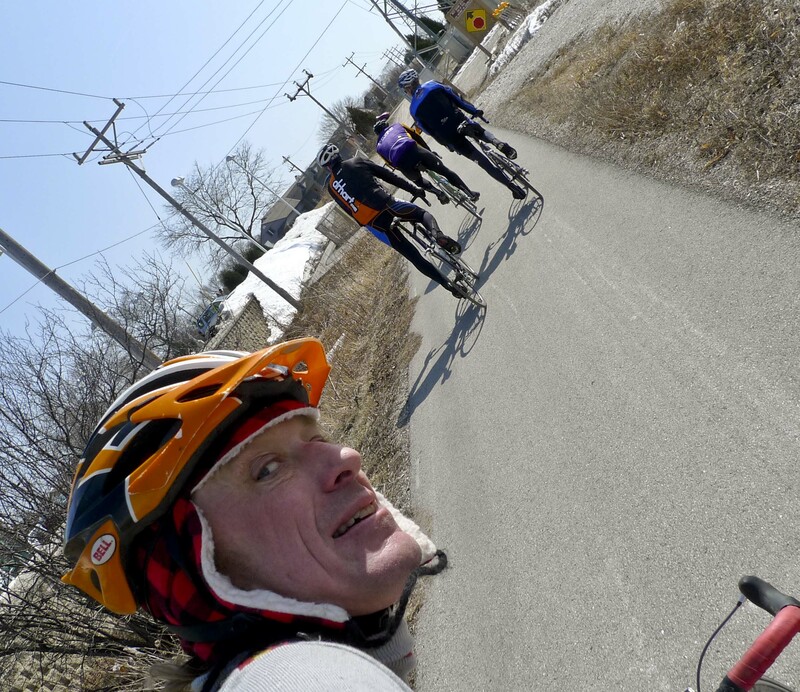 Perhaps once people see how much fun the five of us had riding to Belgium, more will tag along on the second in Spring Classics series: Milwaukee-Paris-Milwaukee. Saturday morning at 7:45 I met Jim, Russell and Ben for a pre-ride meeting at Cranky Al’s Bakery at 69th and North Avenue in Wauwatosa. As a card-carrying member of the pay-day bakery club at work, I am no stranger to donuts. I fancy myself a bit of a crueller connoisseur and I think Cranky’s makes the best in the metro area. After fueling up on tasty calorie dense carbs and discussing strategies, the four of us departed promptly at 8am. The weather was perfectly Belgian, cold, grey and windy. No rain, but you can’t have everything I guess. Our route was east on North Ave. all the way to Newhall. Most of North Avenue has been recently repaved with bike lanes. It was a nice route early on a Saturday morning. We got a few thumbs up and “good mornings” from pedestrians we passed in the central city. I avoid riding on North late at night because there are so many drunk drivers, but during the day it is a nice direct route to the East Side. We bombed Newhall north past Park Street bridge, down the dirt trail connection to the Oak Leaf Trail near the Urban Ecology Center. This would not be the last of our cyclocross exercises for the day. We picked up Gary in Estabrook Park just above the dam. The five of us continued north on the Oak Leaf trail, then to Range Line, the aptly named River Road and onto the Ozaukee Interurban Trail at Mequon Road. With about 30 miles in and another 30 to get back, Jim had to peel off and head back to Milwaukee on his own due to other commitments. I have not heard back from him, but I assume he is not lost somewhere in the northern suburbs. The trail was in great shape until we got just south of Belgium where we hit some snow. If you carried enough speed and unweighted your bike, you could ride through most of it. But once we hit Lake, the trail ahead of us was more snow than it was asphalt, so we jumped over to County Highway KW for the last couple miles into Belgium. Both Curly’s and Chrissy’s were closed, so we stopped at a new coffee shop for Minestrone soup and Jarritos sodas. 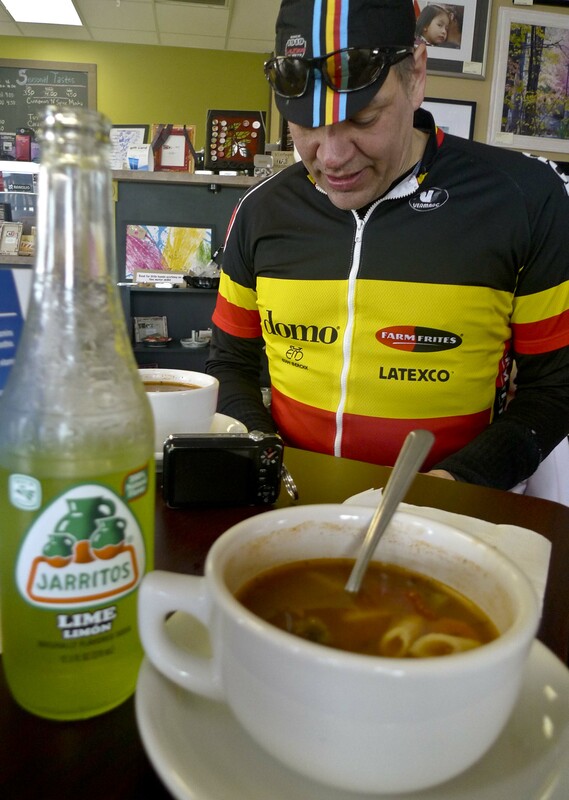 Italian soup and Mexican soda were not quite the frites and beer we had in mind, but they were probably a wiser choice for the 50 mile ride home into a cold headwind. Young Ben and Gary were still feeling spry, so they did most of the pulling on the way back. Russell and I took a few turns at the front, but did not argue when Gary or Ben jumped. Who are we to deny someone suffering if they want it? Russell had a couple flats on the ride, otherwise we did not have any real trouble. We rode at a conversational pace the whole time and stopped for cokes, cheese and chocolate covered expresso beans when the opportunity presented itself. As promised, not a pedal was turned in anger. I completed my day with 97 miles in a bit under 6 hours riding time. Ben is just finishing high school at Tosa East and had never done a century before, so he and Russell road a bit extra after they left my house. 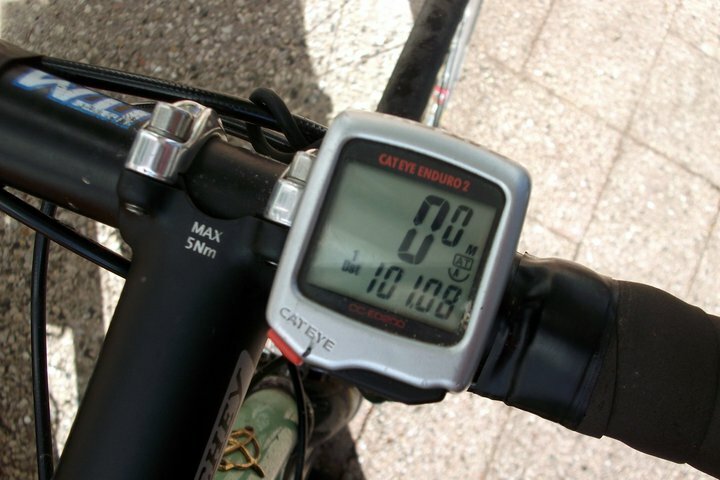 Ben was able to check off a great milestone in his personal cycling record book at an age when I was just riding across town to see my friends. You can ride in my peloton any time Ben! Sunshine? We must have left Belgium. Russell trying to ruin the ride for the third time. Russell’s final for the day. 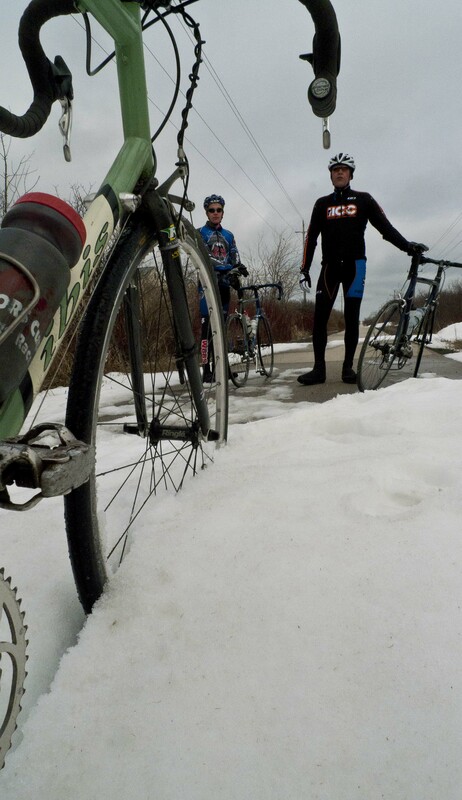 More information to come soon about the OTB Spring Classic #2: Milwaukee-Paris-Milwaukee. Stay tuned here and on the ride page on the menu bar above for the date and details. I happily made it back home after fighting a headwind all the way back. I showed just a hair under 60 miles. Thanks for the invite and fun. Looking forward to doing it again next year. Glad to meet you and glad you enjoyed your ride. Remember there are other rides on the Ride Calendar at the top of the page. No need to wait until next year to ride together again!